Mercury offers a comprehensive range of tools for 3D structure visualisation and the exploration of crystal packing. With a long pedigree and over 10,000 downloads, Mercury is firmly established as the visualiser of choice within the crystallographic community. Mercury is available as a free download with more advanced Mercury features and exploration of the full Cambridge Structural Database (CSD) available with a CSD licence. Advanced features will be greyed out in the absence of such a licence. If your institution has a CSD licence, you may obtain this functionality by registering your copy of Mercury. To check if your institution has a CSD licence or for information on how to obtain a CSD licence, please contact us. More information about these advanced features is available on our CSD-System Mercury page. This free version of Mercury has a vast number of options for customising display settings and is widely used for the generation of publication-quality images. A Style Manager contains a number of pre-defined display styles for work, publication and presentation and also provides the ability to preserve and share your own custom display settings. Stunning 3D images created using Mercury can be exported in a variety of common formats. In addition, it is possible to render high quality ray-traced images using POV-Ray. Mercury is able to load structural data from a variety of formats and provides an extensive array of options to aid the investigation and analysis of crystal structures. 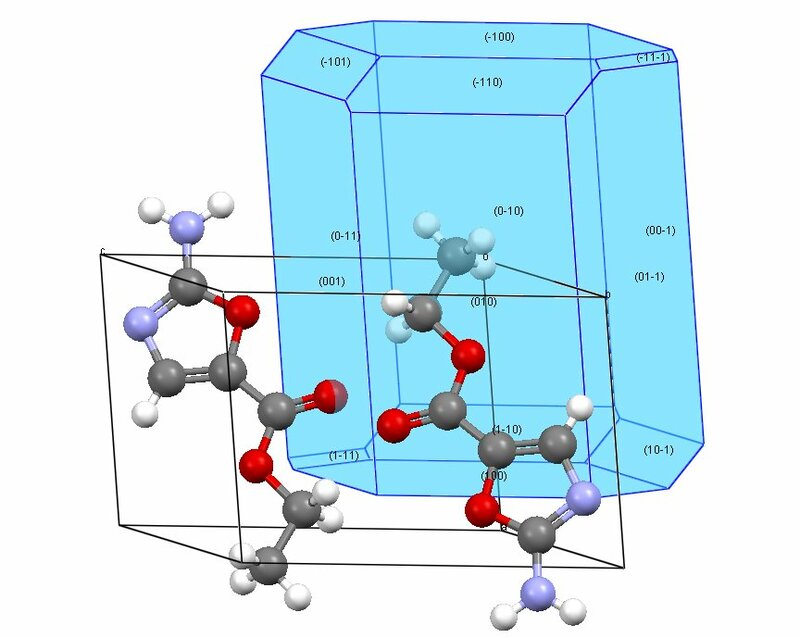 Generate packing diagrams of any number of unit cells in any direction, define and visualise least-squares and Miller planes, and take a slice through a crystal in any direction. Simulated diffraction patterns can be calculated for any displayed crystal structure. Bravais, Friedel, Donnay and Harker (BFDH) theoretical crystal morphologies can also be viewed. A unique and key feature of Mercury is the ability to locate and display hydrogen bonds, short non-bonded contacts, and user-specified types of contacts e.g. chlorine...oxygen contacts in the range 2-4Å. By building and exploring networks of intermolecular contacts you will gain an understanding of the key interactions that drive crystal packing. Display of BFDH theoretical crystal morphology for Ethyl 2-amino-oxazole-5-carboxylate (BOQROO).